No two patients are exactly the same and there is tremendous variability in patient activity. Knee replacements eventually wear out. Unfortunately, an artificial knee is not as durable as your own knee. Because the knee replacement implants are made of metal and plastic, over time, these materials begin to wear, just like the rubber on your car tires. While knee replacements are designed to last a long time, they will not last forever. In the 1960s and 1970s, most believed that total knee implants would last about 10 years. This was one of the reasons that knee replacement procedures were confined to older patients. As time passed, it became apparent that the great majority of knee implants would last approximately 20 years and even longer. Improvements in surgical technique, materials, implant designs and fixation have escalated over the past two decades resulting in increased durability of knee implants well beyond even 20 years. There are many still active patients whose knee prostheses were put in as long as 30-40 years ago! However, as with any medical question, the longevity of a knee implant will vary from patient to patient, due to differing physical condition, activity, weight, skill of surgeon in placing the implant and more. How long a total knee lasts depends on how much it is used, what types of activities it is used for, how heavy the patient is, whether the patient has regular check-ups with the doctor and whether the patient is staying in good physical condition. Total knee replacements are designed to provide painless and unlimited standing, sitting, walking, and other activities of normal daily living. They do very well for golf, bicycling and swimming. They are not designed for jogging, or sports like tennis and skiing – although there are patients with total knee replacements that do these things! Total knee replacement surgery is done to improve quality of life. Each patient must decide for themselves what makes life worth living for them, and then pursue happiness through those activities. You should be aware, however, that the longevity of a total knee replacement may be shortened by frequent, vigorous activities. 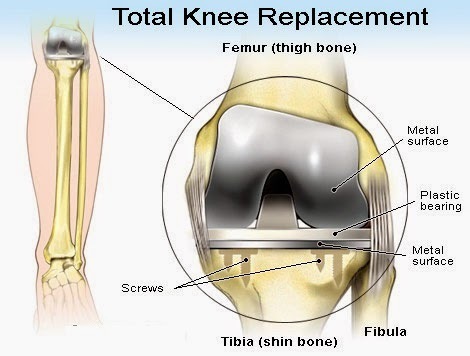 In the event that a total knee fails, it is possible to implant another knee replacement. Such revision total knee replacement surgery may be a lesser or greater operation than the original total knee surgery. Similarly, recovery from revision total knee surgery may be easier or more difficult than it was from the original total knee surgery. In general, the results of revision total knee surgery are not quite as good or predictable as for primary total knee replacements. The results of revision total knee replacement depend on what the problem was that necessitated surgery. Following revision total knee replacement, most patients have good relief of pain and are able to walk as far as they desire.